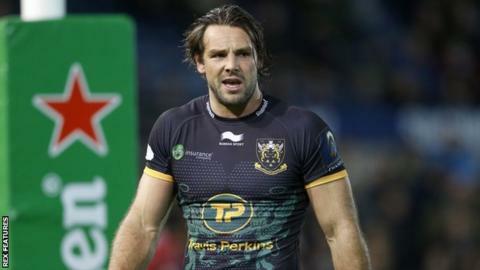 Northampton back Ben Foden can end his two-year England exile, according to Saints director of rugby Jim Mallinder. The 30-year-old, whose last of 34 Test appearances came in November 2013, helped Saints defeat Glasgow in the European Champions Cup on Saturday. "I saw him talking about England and trying to get back into that team," Mallinder told BBC Radio Northampton. "He just needs a few more performances like against Glasgow and hopefully the people will be looking at him." Foden missed the second half of last season with a knee injury, ruling him out of the Six Nations and he failed to make Stuart Lancaster's World Cup squad. Mallinder added: "He's always been a quality player and he's backing up a few performances now. Hopefully he can stay fit and deliver all through the season." Saints are currently 10th in the Premiership after winning only won one of their opening four league matches in 2015-16. But the victory in Scotland backed up the previous week's win at home to Scarlets and Mallinder wants his side to build momentum when they return to league action. "I think it was a step up from how we've played this season," he said. "I think the intensity in attack, particularly in defence, was where we need to be. "We're going to have to back it up next week because Gloucester are a similar team, they've got some massive threats, particularly out wide."